We’d love your help. 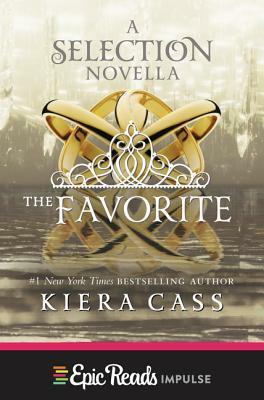 Let us know what’s wrong with this preview of The Favorite by Kiera Cass. Revisit the captivating world of Kiera Cass's #1 New York Times bestselling Selection series in this digital original novella. Told from Marlee's point of view, this all-new 64-page story returns to the fateful Halloween when Marlee and Ca While America Singer's heart was torn between Aspen and Prince Maxon, her friend Marlee knew exactly what she wanted—and paid the price. To ask other readers questions about The Favorite, please sign up. Is there a Kriss novella? Muse-ic ♬ I wish there would be one from Celeste's POV. I want to see her though process! Why did the publisher remove this book from Kindle pre-order? Kirsten Tatum Here is Kiera Cass's answer and updates! More like The Money Grab. Marlee (along with a gaggle of of other girls) is in a pseudo The Bachelor competition for Prince Maxon. That's right. This kingdom picks its new queen by a televised reality TV show. Marlee is the people's favorite - which carries a lot of weight. And despite being the favorite, Marlee has a pretty big secret - one that even her best friend The Favorite? I’d rather have my last memory be of his death than suffer knowing that his last memory was of mine. I had found my soul mate. I knew it. And there was too much love in my heart to leave room for regret. You are honestly telling me that you were so in love with your soulmate that you absolutely had to sneak around with him even though you knew both of you would die if you got caught. Are. You. Freaking. Kidding. Me. Gurl. What is wrong with your hormones? How hard could it have been to wait a couple of months? To bow out of the competition? Anything to ensure that you both wouldn't DIE? Instead, you just had to risk both of your lives for a little nookie in a castle alcove. So, America sees what happens during Marlee's and What's-His-Face's sentence...and continues her affair with Aspen. What the what? Did she not just see the beatings? The death sentences? Why? Just why. So Marlee and What's-His-Face are publicly beaten in front of the entire nation. And Maxon has this "clever idea" to hide them in plain sight - as servants in the castle under fake names. The very same castle that housed Marlee for the last six months and televised her rise and downfall. And it works. Marlee's face was so prominent (as the people's favorite) that surely the gossiping servants recognized her. Everyone is so cast-oriented that I cannot believe that they would be fine with two traitor "Eights" in the servants' quarters. Which leads me to believe that everyone in the castle must be completely dumb. I am SO done with all the YA books having to write novellas. Read by Arielle DeLisle - no complaints there! Wow! This was a really fantastic novella and I must say this is my favorite novella in the series! It was such a wonderful and refreshing read, it was fast-passed and it made me smile :) This is in Marlee's POV and we get a look into Marlee and Carter's relationship, how they first met, how they fell in love and what happened to them after the caning. I love all the extra juicy details into there relationship and I really enjoyed seeing a few scenes that happened throughout The Selection series but through Marlee's eyes. I have been dying to see what exactly led up to that intense and heartbreaking moment that tore at my heartstrings in The Elite and it did not disappoint whatsoever! Illustration of Marlee & What I picture she'd look like. Illustration of Carter & What I picture he'd look like. Marlee's scene in The Elite was a shocking one but an emotional one. I think I cried, I don't remember exactly. 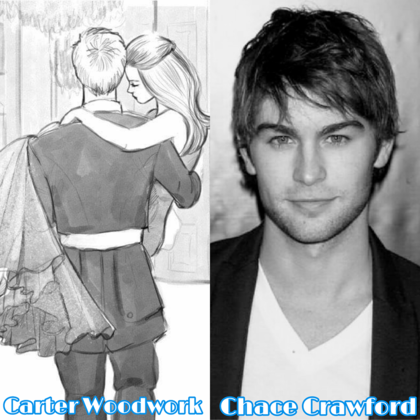 I never knew Marlee would end up falling for someone else other than Maxon. Sure sometimes she was awkward and shy around him and I guess that was hinting, I was just too dumb to figure it out. Or maybe that's just how and who she is. Carter and Marlee were adorable together! I'm not gonna say much, but their story is emotional but cute at the same time. It's sad, but the way they were positive and sure and had hopes they would be together was adorable. I loved how America was there for Marlee and how Maxon left them casteless, letting them choose and letting them live and be happy. I was glad they were able to be together and even though they were taken to a place where riches weren't found, food wasn't blessed, and the best clothes weren't given, they were both happy together and no sad emotions were shown or felt. You know what I felt like happened between the publisher and Kiera Cass? P: *Sighs* Kiera, another book/novella? P: You know I luh de chedda but my conscience is creeping in and i feel like we shouldn't be milking these 9 year old girls of their money anymore. P: Girl, with the way you're going, you will go above and beyond. P: FINE! One more book/ novella. Okay. One more. Try not to make things too messy and just finish the damn thing. LOVED The Favourite and I love King Maxon even more now. I love how he went out of his way to care for Carter and Marlee and what America and Maxon did for them at the end, so sweet. Such a fun read for Saturday! I love the Selection world and it was fun reading this short story. Way cute, as always. so i’ll be honest, I completely forget most things about the “selection” series but the marlee & carter story is one that I still remember. & I saw this novella and just thought okay, yes, I stan, let’s read. one thing i’ll like to say before my gushing begins is that THE WRITING. omg. THE WRITING. was this how the entire selection series was written? i hope not. the writing was kinda really bad as compared to a lot of the new books i’ve read and that’s my opinion so don’t @ me. but I totally get that this is a novella like 58 pages long so whatever bUT i’m second guessing my ratings for the other three real books because I don’t remember if the writing was this bad. anywaysssss onto WHY I LOVE MARLEE AND CARTER SO. MUCH. i am absolute and utter trash for princess/guard stories like these. to be fair i’ve only read like two other stories with this but I LOVE IT. I have no clue why I love princess/guard love stories. but I do. this novella basically gives a glimpse at the thought process of Marlee through falling in love with Carter, the caning, and life after that (all the way up to after the One). it was really short so not that substantial, but like I said, I was so ready to remember why I was obsessed with this couple. shssshjxaha carter is so underrated like, maxon who? we only love carter in this house? and while there are some really cliché dialogues and there were times (yes even in a 58 page book) that I was cringing just a bit, mostly due to Marlee’s way of talking/the words used to describe how she was talking (i don’t even know if I make sense). and also, I so wish that their relationship was fleshed out more in the beginning. I’d gladly read like 100 pgs of them falling in love slowly asjsdshcs anyone know any good fanfics about them?? I kept my face turned, trying not to get anxious at the sounds Carter made. I only love my bed and Carter Woodwork, I’m sorry. they literally give each other PIECES OF TWINE AS WEDDING BANDS it’s just,,, too much to handle for this romantic over here. Esta historia corta casi me mata de todos los feels que me produjo. Miren, Marlee no era de mis personajes favoritos en The Selection y, a pesar de lo que le sucede llegado cierto punto de la historia, no me importó mucho en su momento. Sin embargo, leer toda su historia desde sus ojos es una experiencia totalmente diferente. Sobre todo porque no es una historia lineal, sino que va dando saltos del presente/futuro al pasado. Creo que mi problema con Marlee es que no conocí su historia de amor pr Esta historia corta casi me mata de todos los feels que me produjo. Miren, Marlee no era de mis personajes favoritos en The Selection y, a pesar de lo que le sucede llegado cierto punto de la historia, no me importó mucho en su momento. Sin embargo, leer toda su historia desde sus ojos es una experiencia totalmente diferente. Sobre todo porque no es una historia lineal, sino que va dando saltos del presente/futuro al pasado. Creo que mi problema con Marlee es que no conocí su historia de amor prohibida con Carter de primera mano en los libros de The Selection, así que todo fue muy "se enamoró de un guardia y ahora los tienen que azotar, volver Ochos y echar del Palacio". ¡Pero todo cambia cuando lees The Favorite! Con esta historia corta ya conocemos cómo fue el primer encuentro de Marlee con Carter, cómo coqueteaban a escondidas, cómo se robaban sonrisas, roces, guiños... cómo se enamoraron perdidamente el uno del otro. I liked Marlee and I liked Carter. I was upset what happened to them in the regular series. I'm glad this gives the view from Marlee's side of things. You get to see a few behind-the-scenes that were not in the regular series. I was glad they could be together but never understood the whipping. I would have just fired him and sent them away. They weren't doing anything in front of the cameras so the general public didn't know. WARNING: You should NOT read this novella before you read The One. You will be spoiled for the ending. Oh, yeah! I can't for this one. I read this in the Happily Ever After bind up. By far, this was my favorite novella of the series. I had wondered what exactly led up to that pivotal scene with Marlee and she's also just a great character to read from. I also enjoyed how we saw a few different scenes throughout the series from her viewpoint. It was interesting to see Marlee's perspective of events, add this to the fact she was one of my favourites characters in The Selection and I wasn't mad by this novella at all. I don't know why these are even needed just repetition of stories. Even if the romance seemed a bit too unrealistic. Or let's say the book tries too hard to be perfect. Everything is just spot on and right. I must also say that whoever Kiera Cass writes as, she sounds just like America. 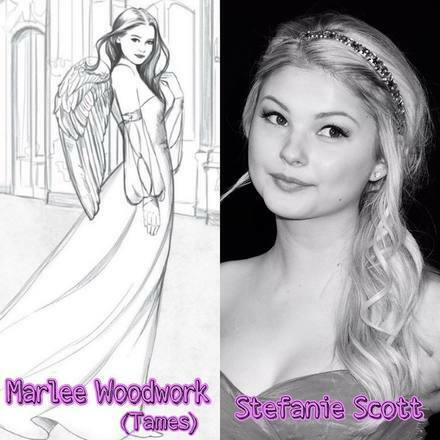 Maybe I have got too used to her tone, but Marlee, Eadlyn, Amberlee - their voices just sounded same to me. Furthermore the characterization in this book felt a bit flat. Fue increíble ver cosas de la cabeza de Marlee y cuánto está enamorada de Carter. ¡Maxon es increíble! ¿Cómo podría alguien ser tan bueno? Era exactamente lo que esperaba que fuera; no solo una repetición de lo que ya se dijo en los otros libros, sino realmente la historia desde otra perspectiva con información que no teníamos. Además ¡Marlee y Carter son tan lindos! La Favorita, es la Historia de la Selección mas corta de las que he leído, pero es la que tiene más información adicional. Es la historia de Marlee, la favorita del pueblo en la Selección, pero encontró el amor en otra persona diferente al príncipe y tuvo que pagar por ello. Está ambientada inicialmente en La Elite pero también en La Elegida y mas adelante cuando ya gobierna Maxon. The Favorite is another companion novella to the Selection series. In this installment we get a behind the scenes look at Marlee and Carter's relationship told from Marlee's point of view. I really enjoy these extra looks into the story as I often feel like the main books left out a lot of background information. This one let's us know how Marlee and Carter met and fell in love and what happens to them after the caning. There were peeks to the events in the main story but adding the extra detail The Favorite is another companion novella to the Selection series. In this installment we get a behind the scenes look at Marlee and Carter's relationship told from Marlee's point of view. I really enjoy these extra looks into the story as I often feel like the main books left out a lot of background information. This one let's us know how Marlee and Carter met and fell in love and what happens to them after the caning. There were peeks to the events in the main story but adding the extra details makes the story much more appealing to me. Overall, an enjoyable addition to the Selection series, best to be read after finishing The One as it gives hints to the ending of that if you haven't read it yet. This was beautiful. I love Marlee so much and I'm so happy that she got her happy ending. Her relationship is so pure and perfect and I loved being able to see different events from her POV. Reading Marlees story was without a doubt my favorite (Hahah, favorite get it?). She is such a lovely character I would love to read more about her! Her story is so sweet and adorable, I loved it! This review has been hidden because it contains spoilers. To view it, click here. So this book was okay, I mean it went fast, but some of the books content didn't make me want more, it left me going ummmmmm. I mean I felt bad for Abril and Juan Diego(?) I felt like they didn't deserve to go to Panama(?) and live in exile. I feel like you weren't though because they are not really important. Also not much of it was memorable. I was glad Woodwork(?) and Marlee were safe. 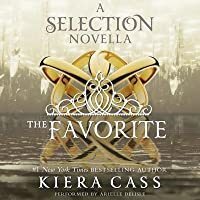 La favorita, última historia corta de la saga "La Selección" y escrito por Kiera Cass. Con este relato me he quedado con ganas de mucho más. La protagonista no deja de sorprenderme en las pocas páginas que tiene la historia corta. Conocer desde su punto de vista su recorrido en La Selección ha sido una delicia a la hora de leer. Sin lugar a dudas es la favorita tanto para el reino de Illéa como para mi como lectora. Shortest Story to make me cry! Ничего нового из этого рассказа я не узнала, но с другой стороны рассказик милый и сахарный. Я рада за Марли и Картера. Слушала как аудиокнигу. Отличная зачитка. п.с. Кире Касс срочно нужно браться за что-то другое, я , конечно, понимаю жадных издателей, хотят легкую денюшку срубить, но епить :D ХВАТИТ! Unbelievable! This is so… short. I know it was a short story… but this is so short for a #1 NYT Best Selling Author. Its like opening it then I just stretched my feet and suddenly I’m done. • The stupid me… saw that it was actually part of an anthology, kinda. Happily Ever After. • As much as I love Aspen I’m just going to give it 4 Stars. And there are some unnecessary Seriously?! That’s it?! Ugh! •	The stupid me… saw that it was actually part of an anthology, kinda. Happily Ever After. •	As much as I love Aspen I’m just going to give it 4 Stars. And there are some unnecessary parts that were written longer than they should and the good parts were cut short. •	When I saw the ‘Part 1’ ‘Part 2’ thingy–what do you call them?–I got so excited. I thought it was going to be a fairy tale or something love story. Part 1 I thought it’s going to be the story of how Marlee and Woodwork met (check), then how they started their ‘affair’ (check), and lastly how they got caught (check). All check… my problem is that none of them were detailed. Moving on, on Part 2 my mind went straight to The Heir. Years after Mer & Maxon got married. How their children got ‘friendly’. I was really happy to have this short story about Marlee. I always liked her and I was really sad about everything she had to go through because she fell in love. I was happy to read about how it all started and how they tried to do the right thing, but in the end, love won. It also made me love Maxon even more because we can see that he didn't want them to go through this, but his father was still the King and had more power than him. This novella is just about how love can be stronger than every I was really happy to have this short story about Marlee. I always liked her and I was really sad about everything she had to go through because she fell in love. I was happy to read about how it all started and how they tried to do the right thing, but in the end, love won. Antes de comenzar con el libro, porque soy así de despiste, me he enterado que se trataba de la historia de Marlee, algo que me ha hecho tremenda ilusión ya que en la serie en los libros se sabe muy poco de ellos. Me ha gustado por una parte saber algo más, pero por otro se me ha hecho todo muy rápido y corto, por lo que no ha terminado de gustarme. Así que me quedo con unasensación dulce y amarga a la vez pero saciada de ver la historia de la mejoramiga de America. Nota**: creo que me he tragado Antes de comenzar con el libro, porque soy así de despiste, me he enterado que se trataba de la historia de Marlee, algo que me ha hecho tremenda ilusión ya que en la serie en los libros se sabe muy poco de ellos. The Favorite was my favorite short story of the saga The Selection. How not to love Maxon? This story once again showed us how wonderful the prince is. This story is told in the first person by Marlee, we can see how the romance started and his thoughts during all doom and torture that she and Carter were subjected. We can also see why America like her very much. La mejor de todas las novellas, me gusto más que La Elite y La Elegida juntos. Me leería un libro completo sobre Marlee y Cárter encantada. Hasta me han caído mejor que América, Maxon y Aspen. Se convirtieron en mis personajes favoritos de toda la serie. Lo único que lamentó es que fuera tan corto... ¡Me encanto!